SideSwiper Net -- SSN: G0JWB's keys. 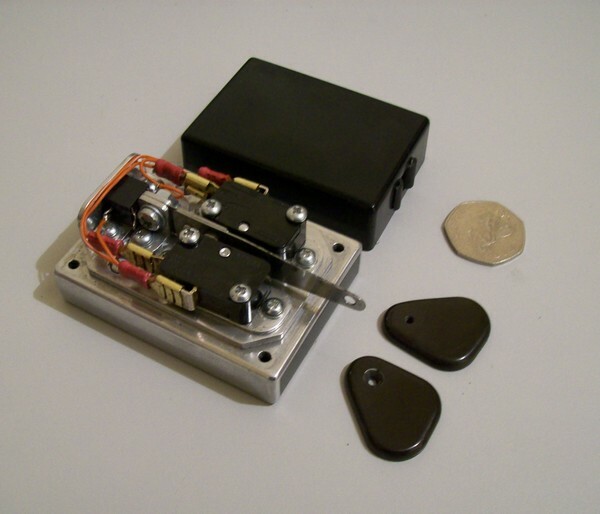 TWanger Sideswiper by TW Radio. 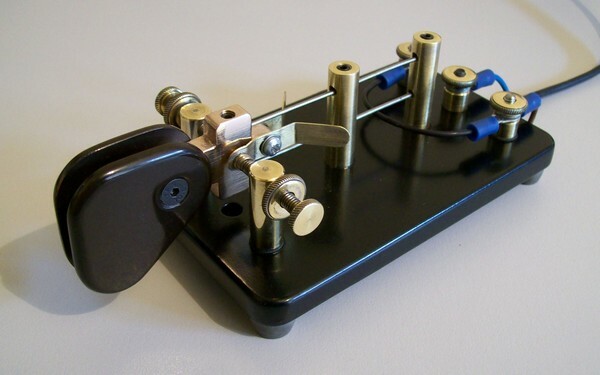 I obtained my full licence in July 1988 and was instantly 100 percent CW on the bands using a cheap hand key. 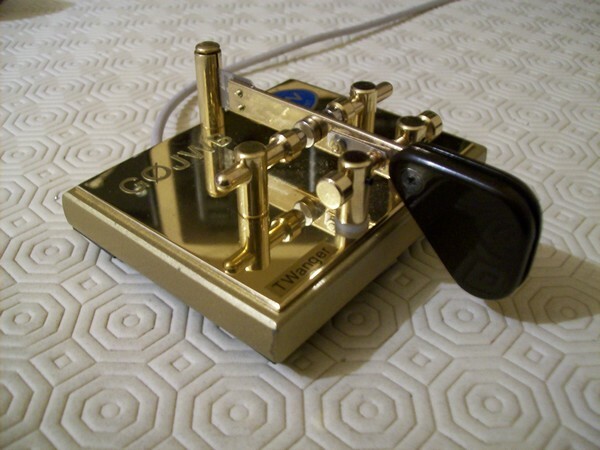 In mid 1989 I decided that I needed to use some kind of paddle, so, in the true spirit of Ham Radio, I made this one from my junk box. 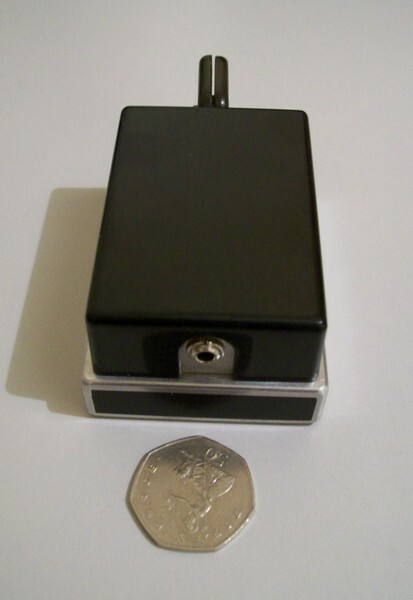 It was made from the inside of two 15 amp UK household power plugs, a nail file and a piece of Perspex for the base and another piece for the finger plate. It was so lightweight that I had to stick it to my desk to stop it moving. Surprisingly, it works very well. 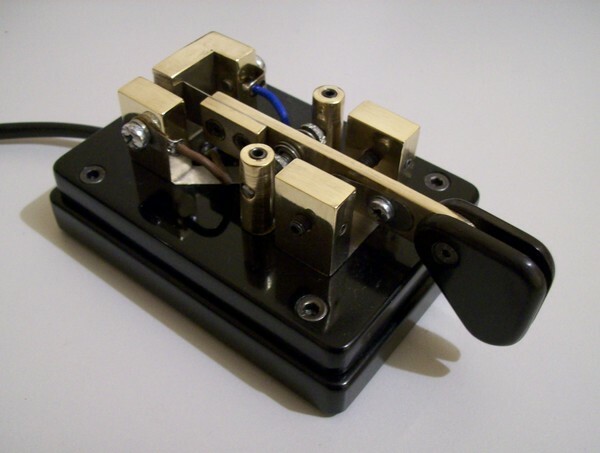 It was originally used as a single lever key, but recently I used it for Cootie practice. I know it is not the best looking key ever made, however it is nostalgic. [G0JWB]. I recently obtained this key from Tom G3HGE who produces them. It goes without saying that Tom makes an excellent job of his keys. The only thing I changed was the fingerplates to my liking. It is an excellent key and a delight to use. [G0JWB]. This is my latest home brew key. 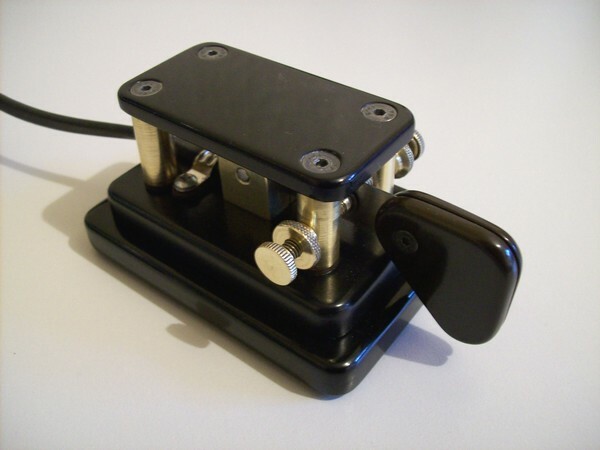 It was designed primarily as a sideswiper key with the option of single lever operation. The key was made using parts from my junk box. The base is a piece of steel which had been sitting in my garage for well over 20 years. It was exactly the correct size and only needed drilling and painting. The posts and adjusters came from an incomplete J36 bug key, which was kindly given to me by Kevin M0AGA, some years ago. The "Spring" is from two lengths of stainless steel from a mobile whip, this was to stop the springs from twisting. 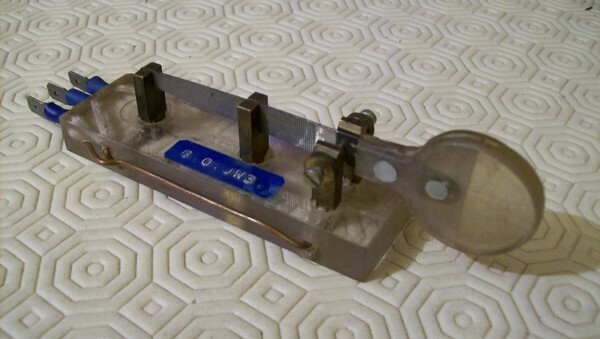 The handle assembly was made from a piece of copper, using Bakelite finger plates. I made the movable contacts from some brass sheet and brass screws. The key feels and works excellent It now sits proudly on my desk, plugged in and ready for use. The key cost me 1 Euro and that was for some screws, guess it was made in the true spirit of the hobby. [G0JWB]. The component parts of the key were all mounted on a piece of black Perspex to insulate them from each other. The retaining screws were all countersunk below the bottom surface to insulate the key from its base. Three of the electrical connections were made underneath the posts using a tin plate shim. The fourth post carries the arm, contacts and finger plates. The arm pivot is a short length of .00015 inch feeler gauge. The base is cast iron and quite heavy. A non slip pad was glued underneath the key to prevent any movement when in use. The key has a positive feel and works well. [G0JWB]. This key was designed as a dedicated sideswiper. It was made entirely from the contents of my junk box and materials that I have been hoarding for years. To increase the weight of the key the base was made hollow and filled with strips of lead (Pb). The lever and contact adjusters were made from a .0015 inch feeler gauge. 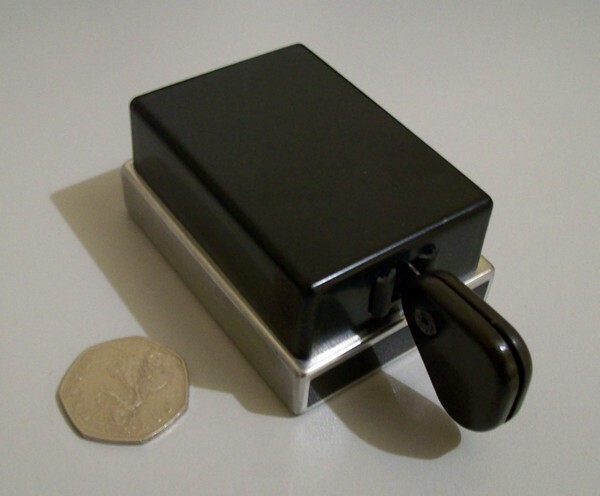 To keep the key as low as possible to the desk, the connections were made at the top of the key using a shaped triangular plate, cut from a biscuit tin lid which in turn is covered by the top plate. The key has a very smooth action and works superb. Key Size - Width 58mm, Length 85mm, Height 50mm. I decided to name the key a "Bijou Key" in appreciation of the kindness and friendship shown to me by Yann F5LAW. [G0JWB]. This key was made to fit inside an inverted 72 x 50 x 20mm plastic project box minus the lid. 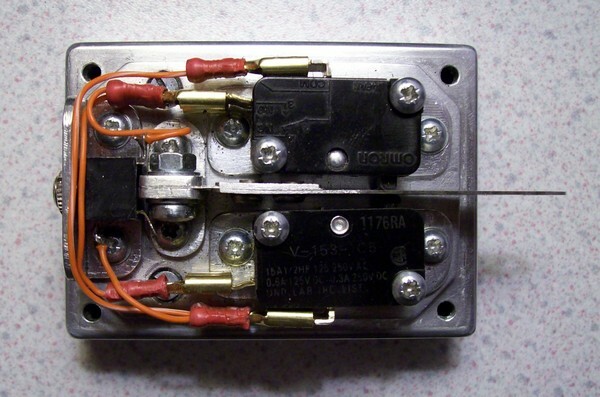 Two micro switches were used as the contacts. The arm is a length 0.0025 inch feeler gauge riveted to a very short piece of 0.0008 inch feeler gauge which in turn is clamped to the rear fixing post. This makes the arm section extremely flexible. 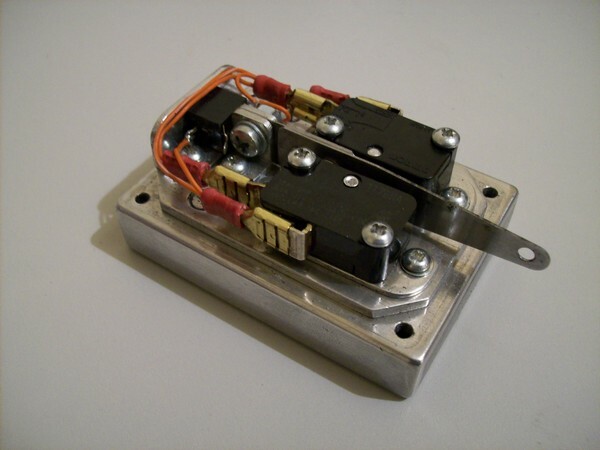 The micro switches were mounted on adjustable plates and also act as the" return to centre" springs. The base was an old Alloy heat sink which was hollow. It was part filled with a piece of steel which all the fixing screws fasten to. The remaining space was filled with strips of lead (Pb). The ends were inlaid using black Perspex. For its size the key is quite heavy. To stop the key possibly sliding on the desk I glued a non slip pad under the base made from a thin rubber washing up glove. A rear mounted mini jack socket was added for the connecting cable to the radio. [G0JWB]. Page updated on March 21, 2011.